As we go into the hottest part of the summer season, many folks hit the pools and waterways for enjoyment and relief. 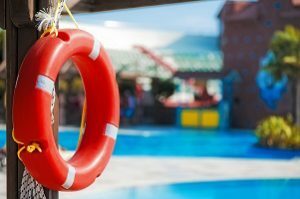 So it is a good time to review some pool safety tips. If you have a backyard swimming pool or hot tub, make it safe for your guests and family, and keep yourself legally responsible. Did you know that anyone who is injured in your pool may have a legal right to file a claim against you? This is true even if that person is trespassing on your property. The sad fact is that drowning is the second leading cause of death, after car accidents, in children 5 years old and younger. Your yard should be fenced, but the immediate area around your pool should also have a fence. If you have small children, make sure that your gate has an automatic lock. Gates, in addition to being self-locking and self-latching, should be well out of the reach of children. Check your spa and pool covers regularly during the summer to ensure that they’re in proper working order. And consider using a surface wave or underwater alarm. Always keep your checklist at hand, and remember to check it often to ensure that everyone who is around your pool stays safe.